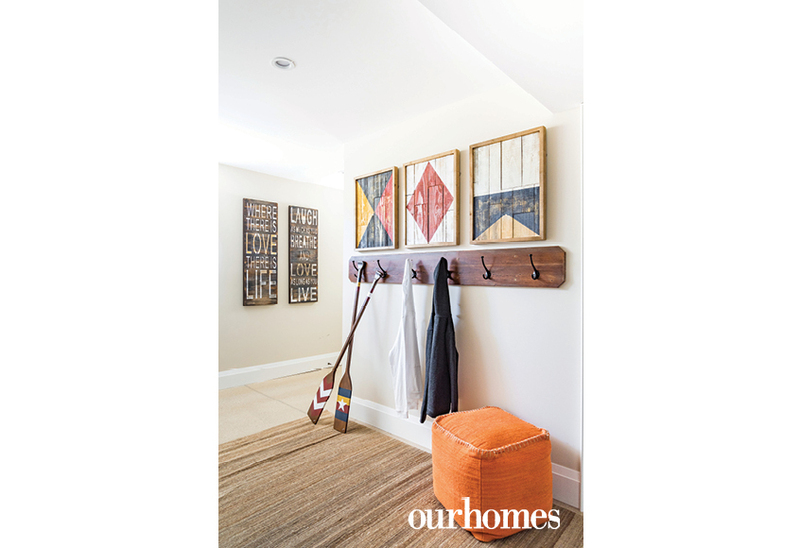 A waterfront getaway with cathedral ceilings is rustic, warm, and oozes comfort. 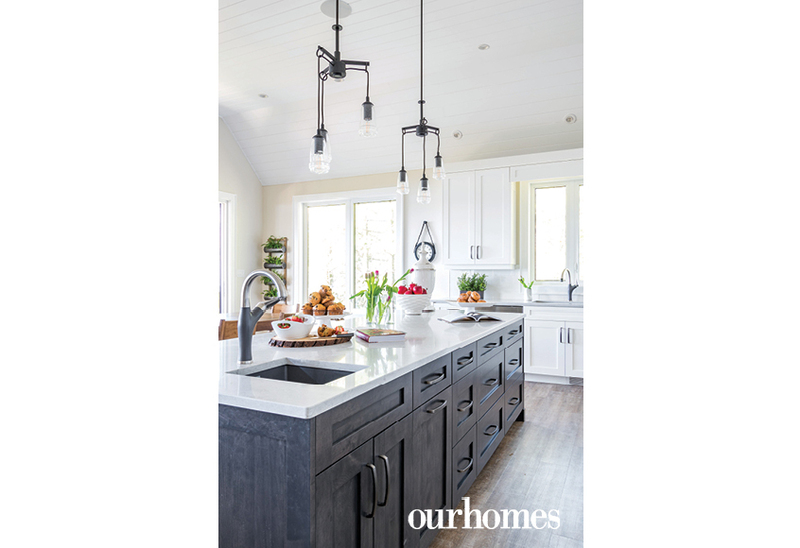 A version of this article originally appeared in the Summer 2018 issue of OUR HOMES Grey & Bruce Counties, p.84. Find local businesses in our Grey Bruce directory. No matter the season, the Macdonald family gathers regularly at their idyllic waterfront cottage on Lake Eugenia. The new build went up recently on a slice of paradise purchased more than 30 years ago by Phil Macdonald’s father and mother Charlie and Peggy. Located just a short drive from their hometown of Meaford, the summer retreat is also close to the family business – Leon’s, with locations in Collingwood, Owen Sound and Orillia. Phil and his wife Marcia Macdonald knew they would fill their home with items from Leon's – furnishings, accessories, appliances and electronics. 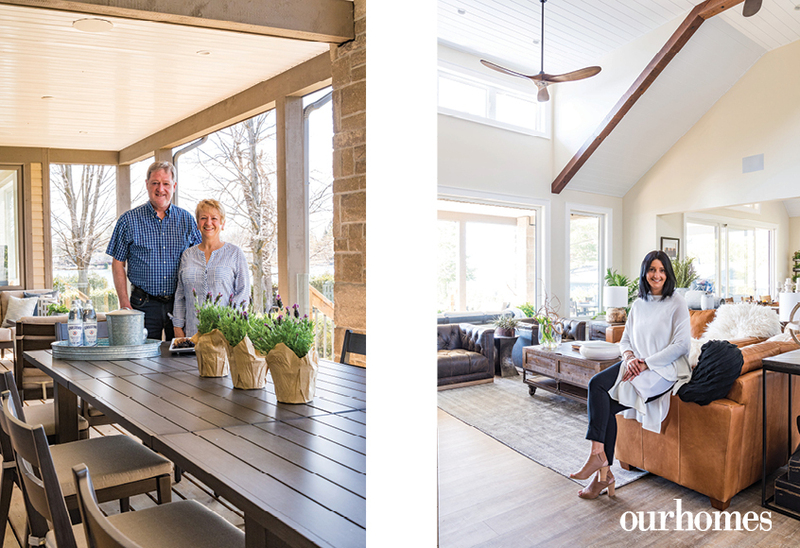 “We wanted a year-round, multigenerational space with a layout that allowed for three generations to live together while also having quiet areas,” says Marcia. They turned to independent stylist Ellen Oelbaum to bring it all together. Ellen says she takes inspiration from fashion and social media and focuses on texture, mixing old and new, all while creating flow. For flooring on the 2,200 sq. ft. main floor, they selected a wood grain, luxury vinyl plank flooring for the main floor of the house from Georgian Design Centre. The large main area looks out onto the sparkling shores of the lake and includes the rustically-furnished great room, kitchen and dining area. Natural Stonescapes completed the landscaping. A state-of-the-art curved smart Samsung TV is mounted on the natural stone fireplace surround (Shouldice Designer Stone), which stretches from the floor to the peak of the cathedral ceilings. 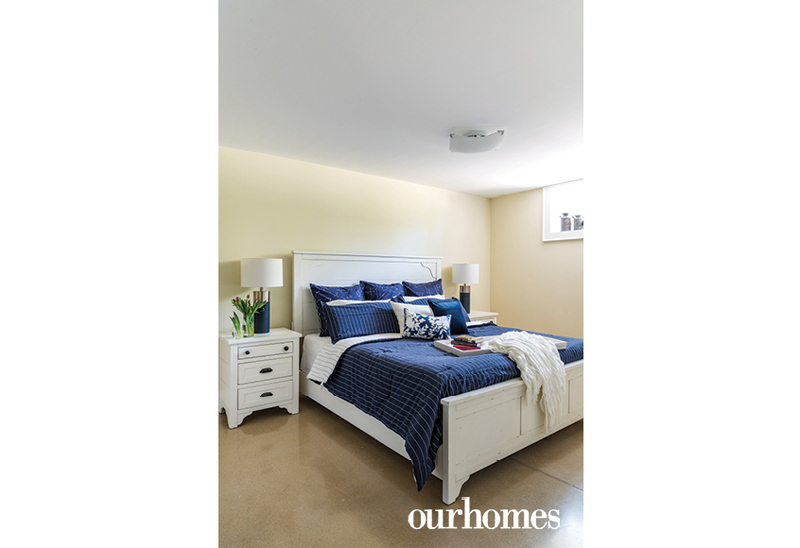 Marcia chose Ballerina White paint from Benjamin Moore for the large, open area. 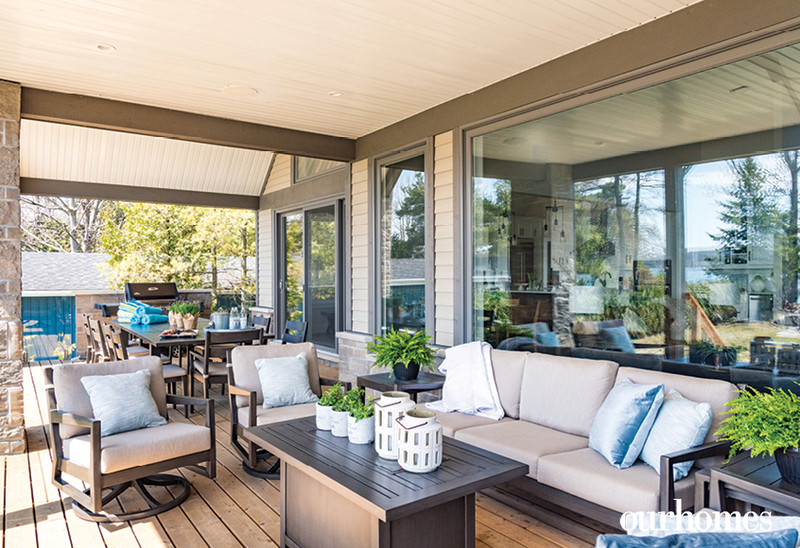 A sunroom (Centre Grey Building Supplies) is adjacent to the primary entertaining space, and it can easily function as a private, quiet area by simply closing the doors. 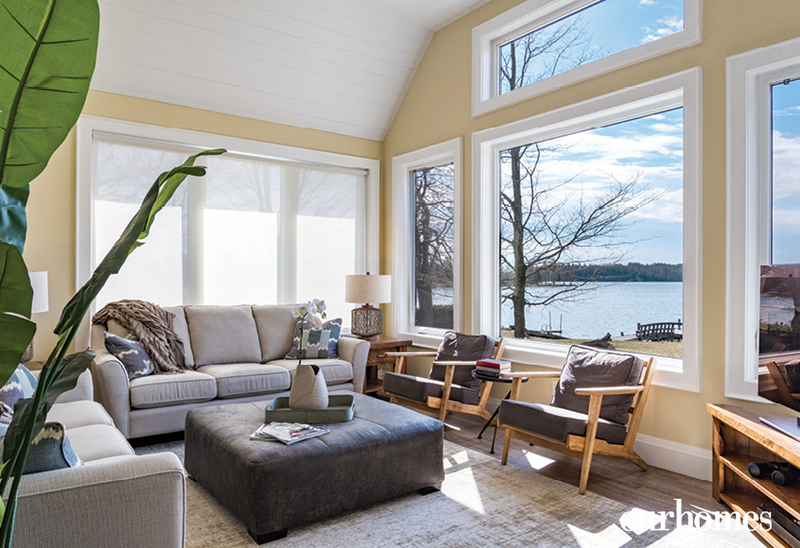 The neutral tones don’t distract from the panoramic views of the lake, which can be taken in through the large windows from Van Dolder’s Custom Exteriors. The Macdonalds worked with Exquisite Wood Designs Inc. to create a serene look in the kitchen with white cabinets and Caesarstone quartz countertops. 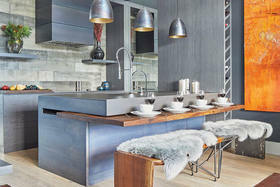 Charcoal cabinets on the island add a dramatic flare to the space and industrial-style tractor seat stools create more seating for a large crowd. The couple’s favourite feature of the home is the large, covered deck, which allows them to enjoy all 75 feet of waterfront. “I love sitting on the covered deck with the fireplace going and just enjoying the lake,” says Marcia. 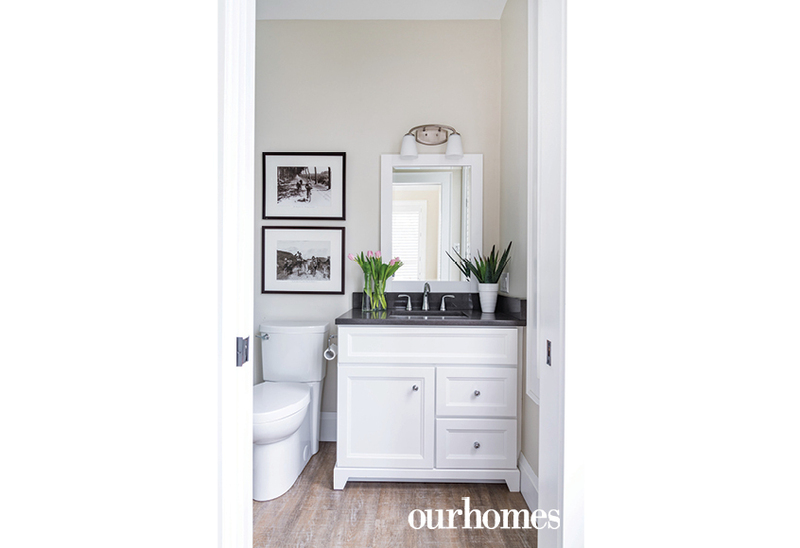 A primarily neutral design palette is brought to life with a lovely mix of materials, finishes and textures in this generational cottage on Lake Eugenia. 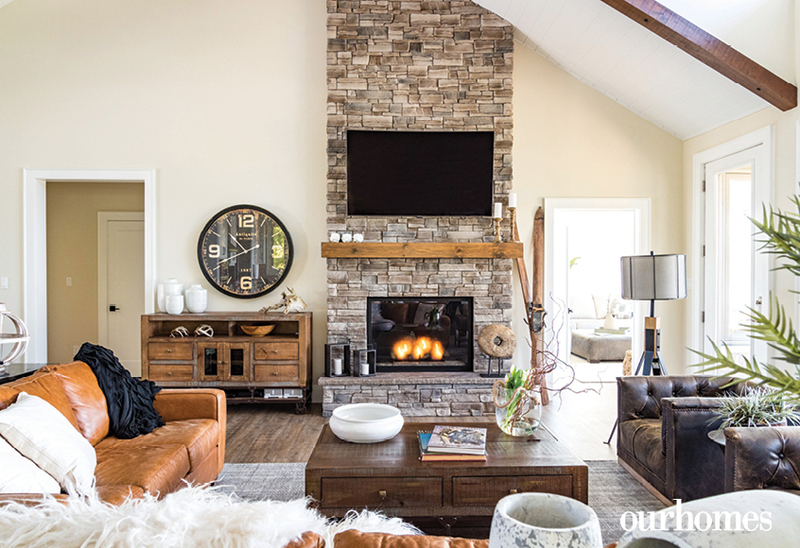 The family opted for durable leather for the great room, which adds to the rustic charm of the cottage. A cognac sofa and love seat are paired with contemporary black club chairs around a natural wood coffee table. LEFT: Phil and Marcia Macdonald own Leon's stores in Collingwood, Owen Sound and Orillia. Their favourite feature in the home is the large, covered deck. 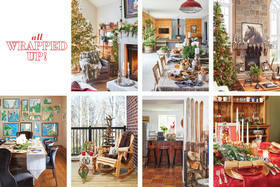 // RIGHT: Independent Stylist Ellen Oelbaum transformed the Macdonalds’ cottage. She works with both residential and commercial clients. The sunroom provides lots of seating and is a pleasant space to be regardless of the weather. The Macdonalds chose simple furnishings: a taupe fabric sofa is paired with Muskoka-style chairs outfitted with modern, mocha cushions. The coffee table and television stand add a rustic touch with their distressed finishes. 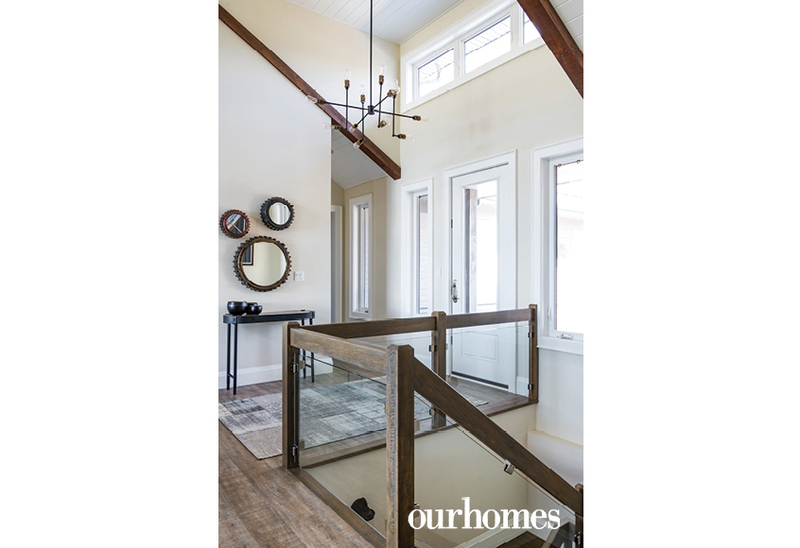 A vaulted front foyer with white painted tongue and groove ceiling, a large industrial-inspired Edison bulb fixture, and rough-sawn timber details all set the atmosphere for the cottage. 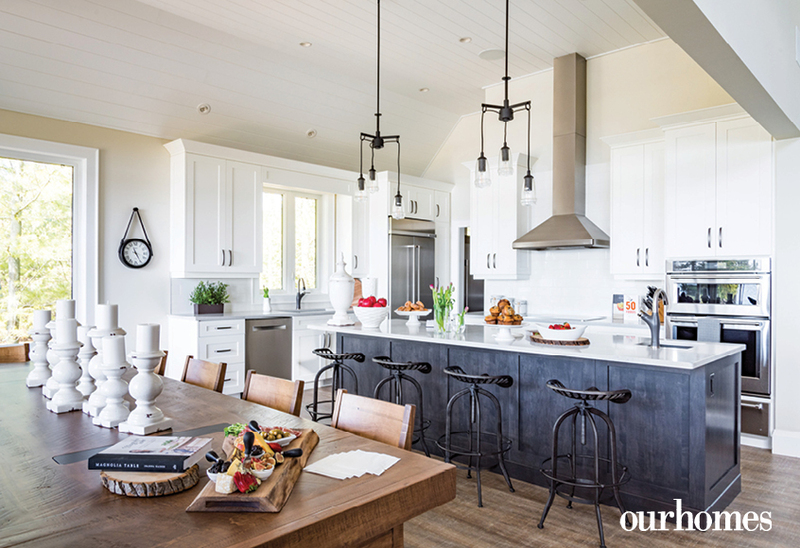 The iron finish in the pair of light fixtures above the island is repeated in the counter-height stools as well as the clock. The Macdonalds chose top-of-the-line, commercial grade, fingerprint-resistant stainless steel KitchenAid appliances. A built-in oven features a warming drawer while an induction cooktop makes cooking a breeze. 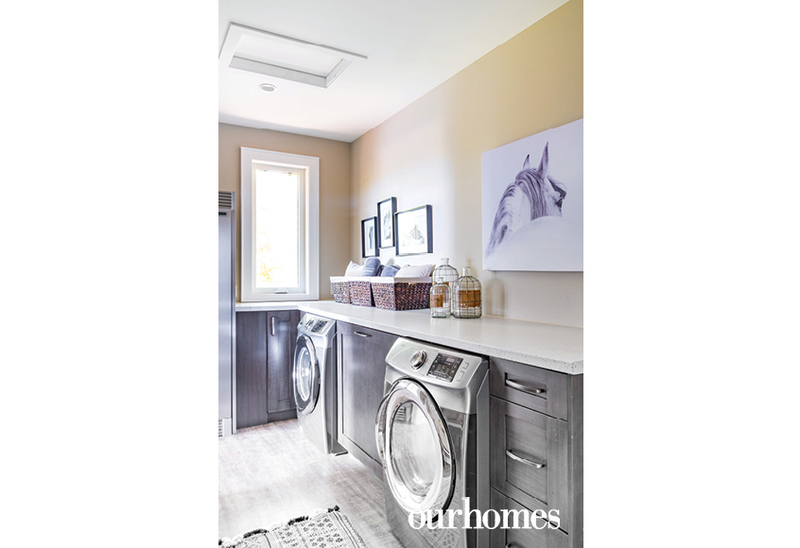 Additional features such as the commercial ice maker, wine fridge and a second refrigerator offer convenience for the frequent house guests. The large charcoal island has lots to offer, including low maintenance and durable quartz counters, a prep sink, plenty of uninterrupted work space and a view to the lake. 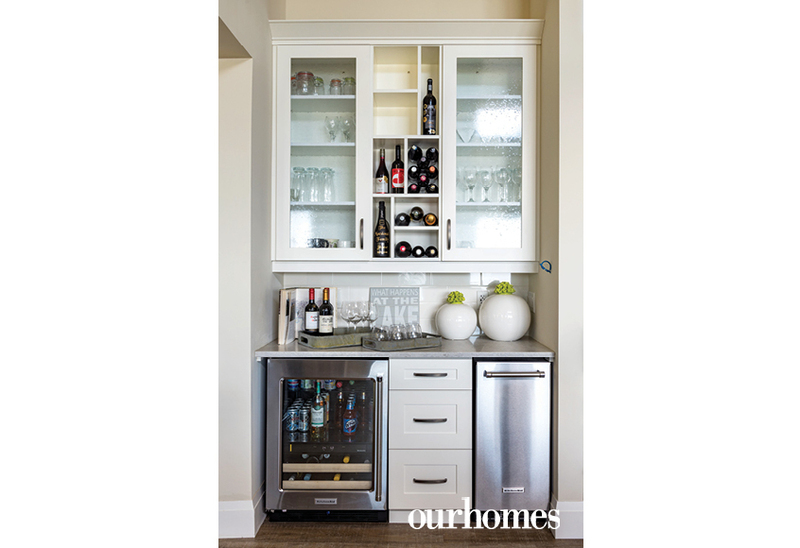 A wet bar is the perfect complement to lakeside living, complete with beverage cellar and commercial grade ice maker. White, black and hits of greenery create a serene feeling in the powder room. 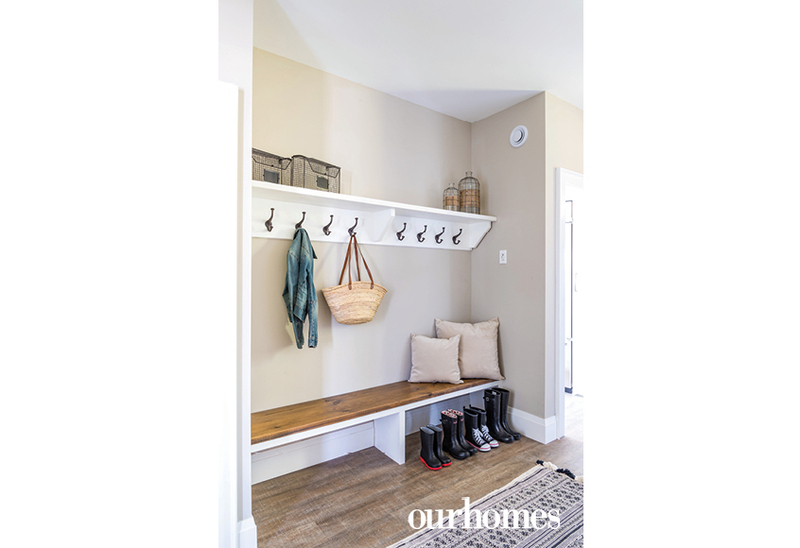 Easily accessible hooks and a bench to perch on create a functional and coastal-inspired mudroom. Life on the lake doesn’t come without laundry – at least this steam washer and steam dryer save time ironing! The main-floor principal suite and a guest bedroom are thoughtfully positioned off the open area to maximize privacy. 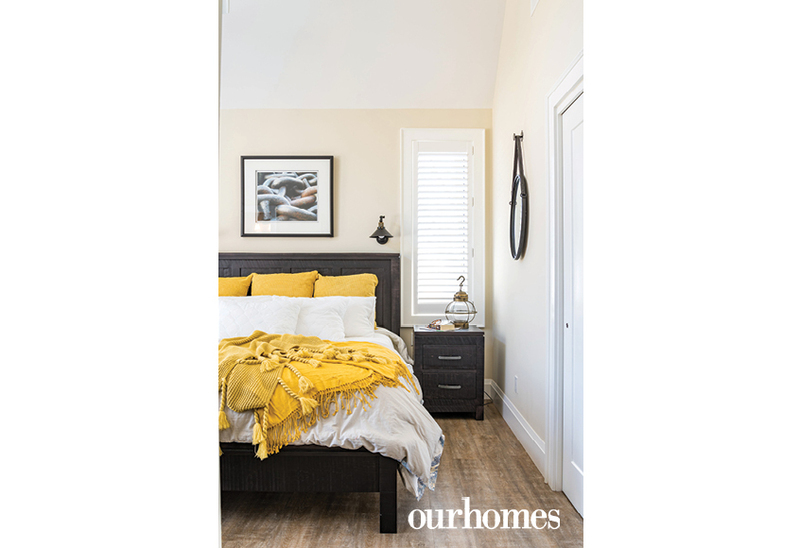 Benjamin Moore’s Ballerina White adorns the walls and allows the dark finish of the bedroom set and cheery yellow accents to really pop. There are four bedrooms, three furnished with king-size beds. White and navy bedding flanked with a pair of matching nightstands and table lamps create this refined retreat for guests. The grandkids’ room features double bunk beds. All offer guests the comforts of home while enjoying their stay at the lake. A unique white-washed chest, striped bedding and accents of blue speak to the lakeside theme. 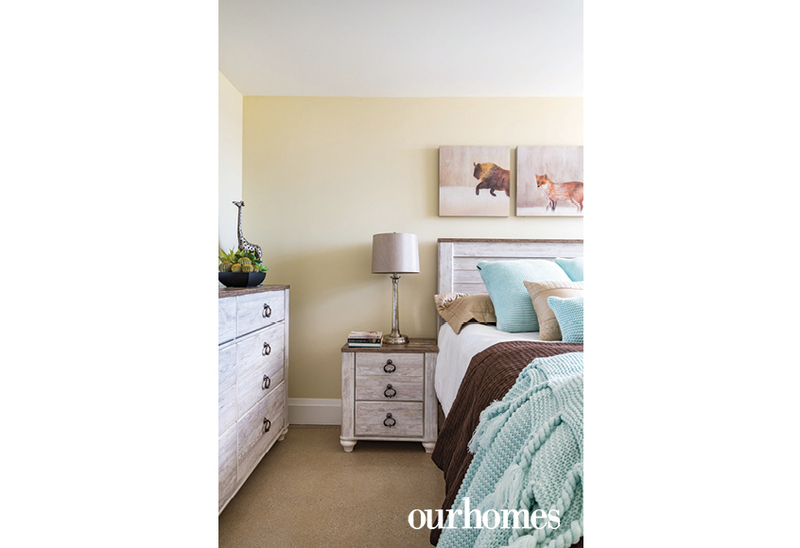 A white-washed furniture collection in a lower level bedroom provides a casual lakeside aesthetic. The lower level, which features polished concrete floors, adds an additional 2,200 square feet of living space. A rec room, made cosy with a large sectional sofa, provides another option for guests to unwind. 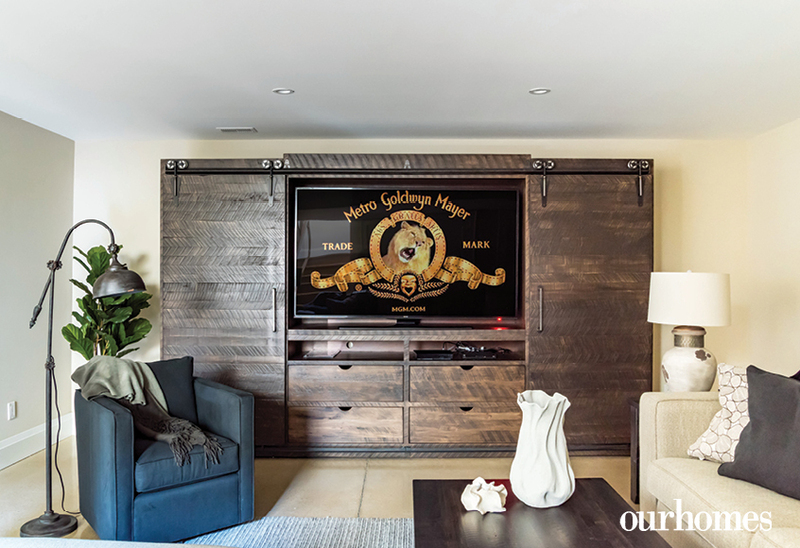 The rough-sawn entertainment unit with sliding door hardware means the television can be hidden from view when not in use. A neutral backdrop allows various colours and textures to pop. With ample space for entertaining – whether dining, conversing or relaxing – the covered deck and its view of the lake is a favoured spot.